Blue Topaz Gemstones And Custom Made Topaz Jewelry. We rightly mentioned in the title that, a fire opal adds spice to an opal ring. Fire opal is an amazing type of opal that breaks many 'rules'. While many popular gems are mined in Australia, the fire opal is found mainly in Mexico. New sources for fire opal gems have now emerged in Brazil and Ethiopia too. The gemstone in a fire opal ring will not try to do the color flashes, play of color stunt but it will instead, hypnotize you with it's gorgeous color and clarity. You would be aware that opal is the birthstone for October, we can tell you that a fire opal would give a unique flavor to your birthstone opal gemstone ring. Fire opal gemstone rings are worn by both ladies and men, men generally prefer the gem when it is a darker shade of reddish-orange. The interesting thing about the clarity of fire opal gems is that, lighter shades of yellow and orange are generally accompanied with a higher degree of clarity and transparency. A gemstone in a fire opal ring that has a rather dark, orange or reddish orange color, will rank much lower in terms of transparency. As mentioned above, the opal in a fire opal ring would not try to flaunt any play-of-color phenomenon. So then why, is it named fire opal, there is an interesting reason for this. The orange to reddish-orange color shade of fire opal gems is a color that, reminds you of fire and flames. This is the reason for calling the gemstone a fire opal. The amazing color of fire opals is derived without the gem being treated in any way. Unlike most other opal gems, gem quality fire opal gems are easily available with a faceted cut. Most opals including white opals, green, opals and pink opal gems are cut with a smooth cabachon cut. The fact that fire opal gems can be had in faceted or cabachon cuts means that, the range of designs and styles for your fire opal ring are virtually limitless. The price of fire opal gems can move up steeply as you move to gems with a fine color and clarity. Like most other gems, a large fire opal gemstone would carry a premium price point. We now come to a few constructive and useful suggestions on caring for your fire opal ring. If you are familiar with any other type of natural opal, the suggested cleaning and storing measures are almost the same for fire opals. Remember that all natural opals contain an element of moisture in them, the moisture also has an active role to play in the beauty of the gem. Heat can dry up the internal moisture of the gem in your fire opal ring, this would reduce the beauty of the gemstone and jewel. You should therefore not expose fire opal rings to sources of heat. Keep this in mind when wearing or storing your fire opal ring. Chemicals, strong detergents and even hair and perfume sprays can negatively affect a fire opal gemstone. Opals are not very high on hardness and generally move in the 5.5 to 6.5 range. This means that physical impact can damage a fire opal. Technically we would say that this is one feature that, needs to be considered right from the jewelry design and contruction phase. An fire opal ring with a gem that rises far beyond the surface of the ring, is more likely to have it's gem damaged. This is because the chances of such a gem being hit by hard objects or surfaces is high. These obviously are essentials that a good jeweler should take care of but, you would do good to evaluate your fire opal ring with this knowledge. Here are some tips on how to clean your fire opal gemstone ring. Firstly, avoid using steamers and ultrasonic jewelry cleaners to clean fire opal rings. Both these devices can damage fire opals. A clean ceramic bowl, a very soft and clean toothbrush and a clean, soft piece of cloth is all that should be used. If you find that your fire opal ring needs any more cleaning, take the help of a professional jeweler to get the job done. Soak the fire opal ring in the water, make sure that the water is not warm, it should not be too cold either. After having soaked the ring for around 3 to 4 minutes, carefully pick it out from the water and inspect the jewel. Does the stone look dull on the back side (under the ring). If this is the case, use the soft toothbrush and gentle rub it's bristles under the fire opal gemstone. This should loosen the dust, soap and oil that might be stuck to the gemstone. Once again rinse the fire opal ring in the water, that should be all that is required. Place the fire opal ring on the piece of soft cloth in a safe place, it is best to let the ring dry out on it's own. Blowers both cold and hot, could damage the gemstone, do not attempt to speed up the drying process. While fire opal rings can be made in gold, silver or even platinum, some issues need to be kept in mind regarding sterling silver fire opal gemstone rings. Since all silver ware will show signs of tarnish, it is fair to resume that a fire opal silver ring will tarnish too. Cleaning a sterling silver ring with fire opal gemstone needs to take care of the tarnish factor. There are various types of solutions available to clean tarnished silver jewelry. Chemically treated jewelry polishing fabrics, powders, sprays and even lotions are available in jewelry stores and other places. The main objective when cleaning a silver fire opal ring is to ensure that, the residue from the polishing medium does not remain on the metal or the stone in the form of a residue. For this to happen, you will need to rinse the fire opal silver ring in clean, plain water after the silver polishing task is complete. From our experience, using a reputed brand of silver polish cloth (fabric) is the easiest way to polish the mounting of silver fire opal rings. We have put together a collection of interesting fire opal rings below. The designs are just meant to give you an idea of the concepts suitable for your fire opal ring. Since we make to order all jewelry in gold or 925 silver with gems of your choice, you can let us have your design ideas or images to work with. Gold or 925 silver fire opal rings will have the same quality of craftsmanhip and gemstones, we provide equal attention to both gold and sterling silver jewelry orders. Our support team at sales@kaisilver.com is always ready to help you with any information or merchandise that you need. Having said that, we would not recommend that you make an impulse purchase. Discuss your requirements with our team, study their recommendations and then choose the gem or jewelry provider that you like the best. 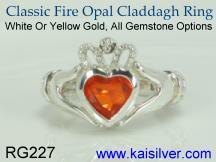 The history claddagh ring as a gold or silver fire opal claddagh ring. You can choose other opal gems for your claddagh opal ring too ... more. 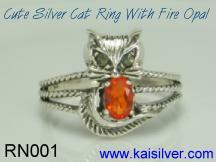 The cutest ring that you will find, a lovable 925 silver fire opal cat ring. White opal is another opal option for this amazing ring ... more. A mens fire opal ring, available as a white opal mens ring or a mens opal triplet ring too. Men prefer the deeper fire opal colors ... more. With over 6,000 buyers in 17 nations, Kaisilver is the world's leading provider of online custom jewelry. Our buyers include fashion models, news readers, hotel and resort owners, members of the U.S and U.K armed forces, business professionals and doctors. Over 3,500 craftsmen and artisans work on all our jewelry orders creating high quality customized jewelry that involves an immense amount of skilled craftsmanship. Kaisilver jewelry gives equal emphasis to good material, good design, good looks, good craftsmanship and longterm durability. With direct and preferential access to prominent gemstone resources in 5 nations, we work with a gigantic gemstone base of over 200 million carats of gemstones. Every gemstone is handpicked and custom cut by our experts and we do not indulge in gimmicks like 'close outs' and 'blow outs' where, low grade gems are loosely mounted in flimsy lightweight gold settings. Since we control the entire procurement and production process, we offer you tremendous customization and flexibility. This is very vital for high quality custom jewelry and is unmatched by any other jeweler. All our jewellery is custom made in 14k or 18k white or yellow gold. You can choose from yellow or white gold and all gem stone options are available. Since each piece is individually made, all design modifications are available. You can even send us images of your favourite designs to be custom made. When you shop at our website, you will be surprised at the comfortable pace at which we allow you to proceed to finalise the order. There is no high pitched sales talk and emphasis is put on guidance rather than order confirmation or profit margins. You are not presented with a standard catalog to make your choice from and each jewel is personalized to your needs, budget and specifications. When you have a query or doubt, you get honest and straightforward answers from real jewelry experts who are real humans and very keen to clear your queries. If you have any queries or doubts please email us at sales@kaisilver.com and we will be glad to answer all your doubts. It does not matter whether the final order comes to us or not. This is the way that we prefer to do business as it helps us bring back the human touch to online selling. Payment can be made through Paypal to our email for paypal INFO@KAISILVER.COM and you can register for a free paypal account at www.paypal.com We are International Verified Premium account holders of Paypal. The procedures followed for sellers to open a full fledged account with Paypal are extremely stringent. The fact that we have been evaluated and accepted for such an account are proof of our reliability and integrity. Paypal has become one of the most trusted modes for online payments, the recent takeover of Paypal by Ebay has further added to it's popularity and acceptance. While we do accept Western Union Money Transfers as a mode of payment, we do not recommend it for first time buyers. This mode of payment works best if there is an established relationship or complete trust, between the buyer and seller. In the absence of this trust, first time buyers often feel that all sellers who accept Western Union payments are fraudsters! We really do not have the time or inclination to try and convince such buyers about how honest and reliable we are. It has always been Kaisilver's policy to encourage buyers to deal with sellers with who they feel comfortable. Let us know if you still, prefer to pay for your Kaisilver custom jewelry through Western Union and we will send you details for the same. 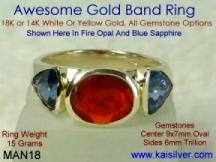 All the content on this web page and website is the sole property of www.kaisilver.com Please do not attempt to copy or reproduce this content in any form. Express permission has been granted to 3 world encyclopedias and 12 universities in U.K and U.S.A. We Are not interested in any more deals for content publishing or content sharing, such communications will not be responded to. Our websites are continously monitored for copyright infringement and our legal advisors have full authority to take legal action in cases where our copyright has been infringed. We do not entertain out of court settlements and do not intefere in the legal procedures being followed by our appointed legal firms. If you are being legally prosecuted in cases related to Kaisilver copyright issues, do not waste your time and ours by contacting us for a negotiated settlement.